Today’s picture is magic…Magic Soup that is! Instead of going on and on about how to make it, here’s the link to the recipe. It’s really easy. Now I don’t put much faith in online weight loss claims like this; I just love a good crock pot of soup in the winter. Normally, I just add my own preferred vegetables with some beef stew and pasta, and there ya go! But when I came across the link to this on Facebook a few nights ago, I decided to give it a try today. The website states this averages about 57 calories per cup and makes about 20 cups. But come mealtime, I’m probably going to eat at least two cups. So, I plugged in all of my ingredients to the recipe maker over at MyFitnessPal.com and came up with 109 calories per each 2 cup serving. So, the website for the soup was pretty spot on. It’s also extremely low in sugar and has a healthy dose of protein. Note it’s just vegetables and beans though! No meat. We are going to sample it tonight as is, and then tomorrow we’ll probably add some chicken to it for a change. 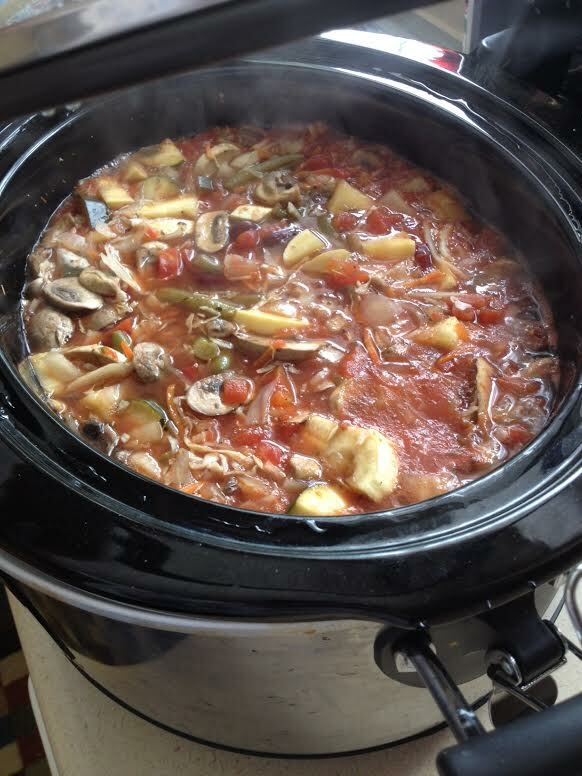 What’s your favorite winter crock pot recipe? Do you have a soup you like to make?